Applying for your AK driver's license must be done in person at a DMV office. You will need to pass driving, written knowledge, and vision tests, and pay the appropriate fees. If applicable, you may also need to pass an alcohol and drug awareness exam. This page will help you obtain your first driver's license from the Alaska Division of Motor Vehicles (DMV). If you've moved to Alaska from another state, you can use your out-of-state driver's license to drive for up to 90 days as long as you're 16 years old or older. NOTE: If you have a commercial driver's license (CDL) from your previous state, you will need to apply for an AK CDL within 30 days of moving. For application instructions, please see our Applying for a New CDL page. Surrender your current driver's license from your previous state. Required for licenses not from a U.S. state or territory or Canada. Additional $15 fee for test. NOTE: If you're under 18 years old, you may need to provide parental consent. A complete list of required documents can be found on the AK DMV website. Commercial driver's license (CDL): Class A, B, or C.
Motorcycle: Class M1, M2, or M3. Instruction permit (if you're under 16 years old): Non-commercial or motorcycle. Provisional (if you're between 16 years old and 18 years old). If you live in a rural community that doesn't currently have an AK DMV office, you may be eligible for an off-highway driver's license. For more information and application instructions, please visit the Alaska DMV website. Additionally, the AK DMV offers REAL ID driver's licenses, permits, and identification cards. A REAL ID in AK gives you the same benefits and restrictions as your regular permit or license BUT because REAL ID meets federal identification requirements it also allows you to complete tasks such as entering federal buildings and boarding commercial aircraft without showing additional identity documents. Applying for a REAL ID in AK is similar to applying for a standard permit or license, which we've outlined below. Have an out-of-state driver's license. Have held your provisional driver's license for at least 6 months without receiving any traffic convictions. For more information about provisional licenses in Alaska, please see our Applying for a New License (Teen Drivers) page. Submit a completed Application for Alaska Driver License, Permit or Identification Card (Form 478). If you're printing the form yourself, you must print it double-sided or the DMV will not accept it. Legal name and date of birth (e.g. U.S. birth certificate, passport, citizenship certificate). NOTE: You will need both a primary document and secondary document. AK residential address (e.g. utility bill, paycheck stub, bank statement). For a REAL ID, you must show 2 documents proving your residency. Social Security number (SSN) (e.g. Social Security card or other official government document). Name change, if applicable (e.g. court order, divorce decree, marriage certificate). Alcohol and drug awareness test, if you're 21 years old or older. Before you will be issued your Alaska driver's license, you will need to pass both a written knowledge and DMV road test. If you fail the exam, you can re-take it the next day. 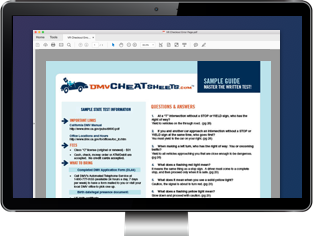 The DMV offers basic practice test to help you study. In addition to the basic practice test offered by the state, we highly encourage you to try our comprehensive online practice tests from our certified partner. It's the best way to prepare for the written exam. If you fail your exam, your driving examiner will let you know when you can re-take the test (usually after at least 1 week). There are various mistakes you can make that will lead to an automatic fail. For a complete list of these, read the Driver Manual.